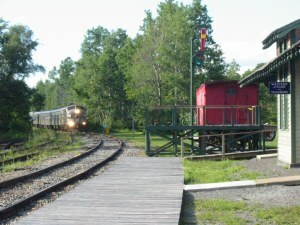 The Adirondack Scenic Railroad uses the Remsen Depot as a flag stop to board and discharge passengers on any of its Utica - Thendara trains (call the railroad to schedule a Remsen stop). The Easter Bunny Express, T-Rex Express and Family Halloween Special all use the Remsen Depot as their destination. From spring through fall, the railroad sponsors a series of Friday night wine & beer tasting trains that travel to Remsen for a short stay before returning to Utica. You can check the Adirondack Scenic Railroad's website for a current schedule and listing of station stops.